After a strong surge of westerlies which dumped copious amounts of rain in several parts of the country, most parts in Tamil Nadu except ghats and extreme south have been left dry. However with the slow reduction in the surge, though the temperatures are expected to be on a slightly higher side for TN, parts of North TN would see increased possibility of thunderstorms in the days to come. The ghats areas of the state would continue to receive moderate rains and there are some rain possibilities in extreme south as well. 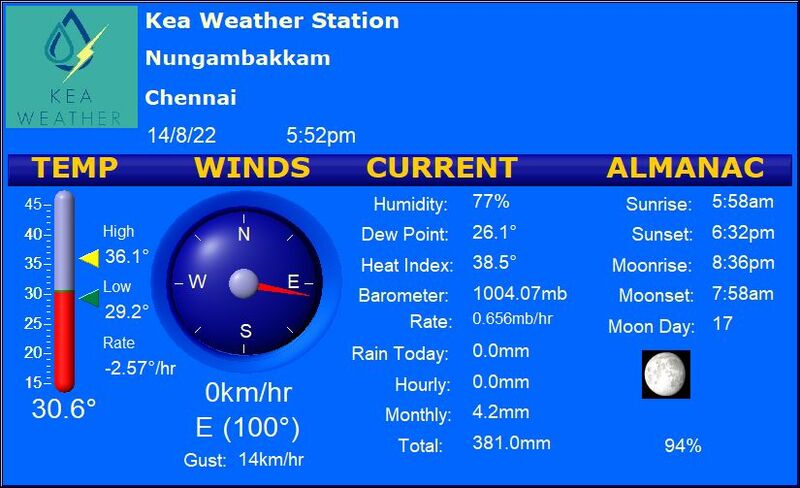 Chennai – Warm with a high of 38 degrees, possibility of a thunderstorm late afternoon/evening. Vellore – Breezy with a high of about 37 degrees, cloudy afternoon/evening. Trichy – Sunny a high of about 38 degrees and a low of about 28 degrees.